It is with great sadness that we announce the passing of our special Mom and Grammie. 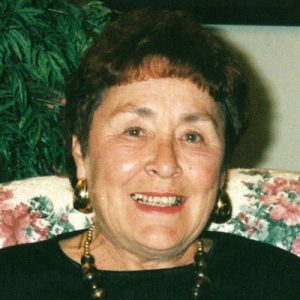 Louise “June” Twack (nee Brewster) passed away peacefully at Kelowna General Hospital on April 7, 2019 at the age of 78. She is survived by her son Michael (Wendy) and granddaughters Alydar, Chela and Anneka of Kelowna, BC, and her 2 daughters Kim Twack (Norm) of Turner Valley, AB and Patti Twack of Red Deer, AB. She was predeceased by her parents and one brother. June was the only daughter and the oldest of four brothers who grew up in Stettler, AB. She married in 1959, residing in Red Deer AB and then moved to Kelowna, BC in 1974 with her children. Anyone that knew June, knows she was a strong, independent, spirited woman who overcame great challenges of the times as well as living with MS from an early adult age. She worked full time, raising 3 children (a challenge in itself) yet she was ALL-WAYS there and would do anything to help her friends and family. Her playful, sometimes mischievous nature always led to lots of laughs and a great time had by all. Her passions were cooking, gardening, sewing and many more. One of the most memorable and proud moments in her life was being a part of and volunteering for the 1988 Calgary Olympics with all her friends at the gas company. So sorry for your loss of a lively fun lady and great mom. We had so much fun camping together when we were all much younger. I can remember her giggle and how sweet it was. Was so good to see you and Mike at such a difficult time. Your spirits of caring were beautiful and so respectful of your mom. Amazing kids are reflective of a great mother! Goodbye mom.i love you and will miss you so much.you will always be with me in so many memories we’ve shared.youve taught me so much,and hopefully I’ll make you proud passing things on.l love you forever. I am so sorry for your loss. I will always miss her sense of humour and wonderful laugh. I have many ‘recipes’ that June shared with me through the years………hand-written by her. I treasure them, & of course, they are good recipes! One of the first ones she shared with me was her “pickled carrots”—so good! She was a great cook. A lot of our phone conversations were about her menus, leaving me with my mouth watering. ( I will never forget her story about cooking her first chicken at age 10, first having to ”put it to sleep” , & secondly having to de-feather & clean it!! ) June was also extremely talented in SO many ways. Her talent has definitely shown up in her 3 children! She was a fun-loving, caring, wonderful person. I will miss her. Patti, Kim, Michael, Memories of you three, mom June, on St. Andrews Drive, are with myself, family, Laurie, Marcia. She was the greatest, a perfectionist that I admired so much. She is an angel and it free. Thinking of you three. Condolences to you Kim, Patti and Michael on the loss of your Mom. I’m sure she was greatly warmed by your help and presence, when falling ill. My thoughts are with you.